Those of you outside the U.S. might not be aware of a little tradition we have here: Thanksgiving. According to our grade school classes, Thanksgiving is a holiday that came about when those wacky Pilgrims finally had a bountiful harvest, held a celebration, and gave thanks. The historical reality is far more unclear, and very definitely subject to interpretation. A quick Google search of "thanksgiving" and "meaning" turns up more stuff than you'd believe. Besides, nobody cares. Thanksgiving isn't about Pilgrims. The whole Pilgrim/Mayflower/Indian story serves merely as the MacGuffin that gives us our day of glorious gluttony. In America, Thanksgiving means parades, football, families, and food. The last two, of course, are the challenge, and here's where my very short survival guide comes in. I, like most folks, have fond memories of family Thanksgiving celebrations. But for years, they somewhat overwhelmed me. Often, we'd be joined by far-flung relatives whose names I couldn't remember. There'd be hugs from old people who shouldn't be allowed to hug without first getting a safety certification. And while there was plenty of food, there was never pizza. It took me well into my 30s to develop two techniques that, when used together, never fail to make Thanksgiving enjoyable to me and those around me. The key, however, is to use these techniques together. Either, used alone, will often result in disappointment, or - worse - more chicken soup than your freezer can possibly hold. You may or may not like turkey (what are you, a Communist?) and you may or may not like dark meat. I love dark meat turkey and I'm not really a fan of white meat. The first half of David's Patent-Pending Thanksgiving Survival Program is to make the day all about dark meat turkey. Nothing else and no one else matters. 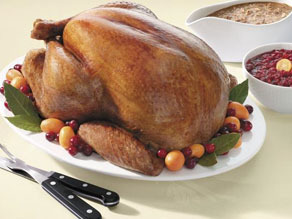 Your mission, above all, is to get to the celebration and to get the dark meat before anyone else can. If you have to hockey check your great aunt to get that haunch, do it. If you have to blockade the kitchen door, do it. Whatever it takes, get yourself that plate full of dark meat (and maybe some gravy). Here's how this part works. First, getting the dark meat means you'll enjoy your meal. But having that as your mission means you'll know what to do and what to say to every family member in attendance. Every action on your part is measured by whether it gets you closer to acquiring or consuming the dark meat. Once you've finished the meal, of course, it's perfectly reasonable (and even accepted) to take a nap, watch a game, or fire up that Xbox you've been praying your cousin still has. The dark meat quest is extremely satisfying, but it'll backfire without the second technique. Nothing reclassifies you from "rude, gluttonous pig" to "extremely polite, nice man" than complimenting the cook. A lot. In every way you can think of. You may have just practiced your body block technique on Uncle Bob, but if you turn to Aunt Alice and tell her how much you love her turkey, you'll get that welcome smile. I'm serious about this. You can get away with nearly any marginally reprehensible behavior at a family gathering if you make sure to effusively say nice things to the cook. I'm talking Jedi-level powerful stuff here. It's amazing. Use these techniques together and it's like you can walk through walls, turn lead into gold, and get all the dark meat you want. Thanksgiving has taken on another role in American society, that of the 'Great American Fix My Computer Day.' That's right, for most Moms in America, Thanksgiving is the culmination of a week of food preparation. And for most of us geeks, it's the day we spend fixing all our relatives' stuff. Most geeks don't mind spending their day off essentially working. Many of us are often more comfortable fiddling with wires than conversing with Aunt Harriet about her recent surgery. And while us good techies are ready and willing to fix anything you throw at us, we do find one thing hard to manage: the coordination between eating and fixing. Most non-geeks rightly think of us as technical gods, able to fix anything instantly with a mere wave of our mouse hand. This, of course, is true. Except for the instantly part. Reinstalling an operating system, removing viruses, or upgrading software takes time. In between typing in codes, clicking on annoying reminders, and selecting the time zone, we're able to come to the table and chow down. But understand that we're going to have to spend a lot of time with your gadgets. So, please, don't give your geeks a hard time if they can't be at the dinner table for the entire event. It's not that we disrespect the family time. It's just that we love you so much, we're willing to give up together time to make your stuff work. Edible gluttony on Thursday eventually leads to commercial gluttony on Friday. My last Thanksgiving survival tip for 2009 is this: chill out. Feel free to shop on Friday, but don't worry. Bargains will be around for weeks. There's no need to be at the store at 12:01am on Friday, pressing so hard on the crowd that the guy in the front is squished as flat as a playing card. Seriously, be smart and be safe. Have a great Thanksgiving. And remember, save all the dark meat for me! I will not be serving or eating a big meal, or subjecting myself to shopping(!) However, my dvr is already set to record the CNN Heroes show. This is how I will mark my Thanksgiving this and every year. I am thankful to CNN for shining the spotlight on these remarkably unselfish and inspiring individuals who set the bar for all of us. I am thankful for all the CNN Hero nominees. Bless your hearts and lives and efforts! Survival guide, make it about family and memories and forget the shopping entirely. Make it a red Friday instead, espeically for the chain stores who import and do little to build our own economy outside the board room.